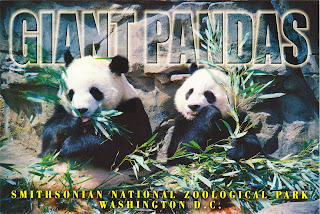 The Smithsonian National Zoological Park at Washington D.C. is home to 2,000 animals of nearly 400 different species. It is best known residents for the giant pandas, along with great apes, big cats, Asian elephants, and many others in residency. Postcard US-2413118 to Czech Republic shows a pair of beloved pandas at the National Zoo. However, the visitors to the zoo today was greeted with a sign that read: "All Smithsonian museums and the National Zoo are closed today due to the government shutdown." In addition, its AnimalCams, including the Giant Panda Cam 1 and Cam 2, were also shutdown. According to the Huffington Post, many people were surprised that the zoo was affected by the government shutdown. To find out how it affects you, visit NPR's blog "a Guide to What would and wouldn't Close".